SOR Club Revolution Vol.1 is a complex but well organised sample collection featuring over 2700 premium sounds, painstakingly produced and selected. Packed with over 1000 of the phattest, fruitiest club oriented drums, basses, breakbeats, synth sounds, cutted vocals, amazing electro sounds / drums, chords, a massive effect section (+360) and 575 totally fresh floor filling kick-free-loops never heard before! This sample pack covers a wide spectrum of Dance genres including Trance, Techno, Hardstyle, Electro and Progressive styles. The huge variety of samples is clearly categorised into folders. Loops are provided with bpm information (140 bpm) and tonal sounds assigned to their root keys. Overall simplified access for direct use. WAV format offers all music software users endless possibilities of application. The CD is of equal interest to both PC and Mac users and includes EXS24 and Kontakt 2 files as bonus material which simplifies loading into the common (software) samplers. Each single bass/acid/synth sample has been mapped to an instrument and can instantly be played over the keyboard. Don`t forget to listen to the second demo MP3 – produced by Ernesto vs. Bastian! Club Revolution Vol.1 marks a new milestone in sound design. It´s the most inspiring sample cd I have ever encountered! CR1 is one of the rare sample archieves that comes with really new, exclusively produced material. Each groove is to be seen as an artwork on its own – programmed perfection. But even better: There are tons of unheard-of drums/electro & percussions sounds, breathtaking and really new FX stuff etc, too. Most of the time SOR keeps the content quite dry, so i can do the creative stuff – perfect! CR1 is so much better than the standard sample libraries with their boring ripped content and it rocks in ways that other developers can only dream of. Revolutionary ! 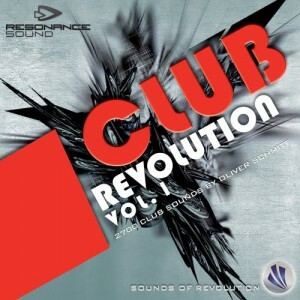 After being a fan of the sound sets for Vanguard and ES 2, Sounds of Revolution delivers a new exciting Sample Collection “Club Revolution Vol.1”. Really fresh and excellent sounding samples for update club music production. It’s not like the usual collection of loops, like other CD’s, which you heard like a 1000 times. They are exclusively produced for this CD, with much love for the details. Even the kick free loops are not just low cutted, they are just programmed without the Kick, leaving the sound spectrum untouched! This gives you much more opportunities and they are fitting perfectly into your sound context. Two Thumbs up! Da ich bereits seit einiger Zeit absoluter Fan der SOR Patches bin und diese regelmässig in meinen Produktionen einbinde, habe ich mir auch ohne Zögern “Club Revolution Vol.1” zugelegt… Und ich musste nach wenigen Minuten feststellen: “Das ist die ultimative All-In-One Compilation” für jeden ambitionierten Hard Dance Produzenten ! Die innovativen und aufwendig produzierten Add On Loops sind derzeit einzigartig und perfekt getrimmt, die Synth Sounds sind brachial… Um das ganze auf den Punkt zu bringen: Diese Sample Pack Reihe ist wirklich revolutionär – ein absolutes MUST HAVE. Ich war dermaßen begeistert, dass ich mir direkt und ohne zu zögern “KICK FREE Revolution Vol.1” und “ELECTRO HOUSE Revolution Vol.1” zugelegt habe. Danke Olli!!! [..] This sample pack is a serious contender for the best hard dance sample pack we’ve ever heard. [..] Oliver Schmitt has done his job well, crafting over 2,700 unique samples, all of which sound wide, deep, punchy and ready for use in cutting-edge dance music. The value of a good samples pack can often be judged on three things; the quality of the sounds, the amount that they inspire, and ease with which you can then incorporate the sounds into your own tracks. German sound wizard Oliver Schmitt spent nearly a year painstakingly creating all the sounds and loops for his first sample pack, Club Revolution VOL.1, which easily ticks all these boxes. […] contains a massive collection of extremely usable effects. The main samples comprise 650mb of 16bit, 44.1 WAVs. Whilst this may not match other packs recorded at 24bit resolution, it allows for twice as much content – and the sound quality is excellent. Also included are 522 patches for Kontact and EXS, which map every single sample and loop to the keyboard. This really is a professional pack made by a producer for a producer, and this is backed up by the long list of testimonials from cutting edge artists who are fans of Oliver’s work. There’s no hand holding here either: what you get are hundreds of individual hits, sweeps and loops that you can incorporate into any style of electronic music. Oliver clearly understands exactly what kinds of sounds make up a complete dance track and has covered every single base with staggering variety. The only drawback is that, with so many quality samples on offer, you’ll find it hard to decide which ones to use. …] varied, authentic and powerful produced […] Here we don`t have only menue-programs, where you can audio test the same samples via the keyboard – added are real playable programs for each single tonal sound. Considering the frame of possibilities this is real luxury. […] Club Revolution can now compete with top dog Mutekki […] Oliver Schmitt sets a course regarding the sound: His samples sound even a bit rougher and cooler than the ones of Mutekki – a good alternative or supplement. Try it out! Oliver Schmitt, mastermind behind the renowned sound forge “Sounds Of Revolution” already could make an excellent name for himself as a designer for sound supplies for Synthesizer like JP-8000, Virus or also Nordlead. Now his first Loop-CD is being awaited and promises a lot: Already when first playing the drum-, bass-, breakbeat-, synth- and effect libraries one is enthusiastic about the solid sound and the thereby high assertiveness of the material. Here one never feels just to get one more “filling material”, all loops seem to be original and perfectly conditioned. A novelty are also the contained 575 no-kick-loops! High recommendation! […]programmed with much love for the details. Drumssounds or loops aren´t sampled/ripped from any other archieves. Treibend, frisch, groovy! Auch hier wurden sämtliche Kick free – Loops von Hand neu programmiert und zum bouncen die Kick gemuted und nicht etwa ein bereits vorhandener Loop gefiltert. Das Frequenzspektrum bleibt also komplett erhalten. Man hört, wie ich persönlich finde, im direkten Vergleich mit anderen “abgesampelten” Loops einen klaren Unterschied. Diese Loops matschen nichts zu, sondern lassen sich extrem gut im Mix platzieren. Alle Loops wurden mit 140 BpM aufgenommen. Die Loops liegen zum Teil als Construction Kit vor. Die “2” und “4” ist meist so ausgedünnt programmiert, dass man sich aus dem mitgelieferten Fundus an Claps und Snares selber die passende aussuchen kann. Wer zu den Loops eine passende Kick sucht, sollte ebenfalls unter den 311 mitgelieferten Kicks fündig werden. Von Hard-, Distorted- bis hin zu Soft- und Sub-Kicks ist wirklich alles dabei. Da auch die Kicks von Oliver Schmitt neu programmiert wurden, klingen sie entsprechend gut. Wie bereits im Interviewteil des Tests zu “Electro House Revolution” zu lesen war, hat Oliver Schmitt die Kicks aus einzelnen Bestandteilen zusammen gesetzt und bearbeitet. Aber auch die restlichen Kategorien werden gut bedient. Effekte, Percussion, Vocal-Bits, Claps, Snares, Cymbals, Percussion, Toms etc. Die Vielfalt und dennoch gleichbleibend hohe Qualität bei dieser CD ist wirklich bemerkenswert. Hauptgrund: Bis auf die “cutted” Sounds (s. Übersicht) sind alle Samples sozusagen handverlesen. Unschöne Artefakte sucht man hier umsonst. Hier wurden die Single Sounds nicht aus einem Loop freigestellt wie bei anderen Libraries. Eine gute Idee sind die “Overview” Sounds. Man kann die Sounds der Kategorien Bass, Acid, Synth und Sounds schnell auf der Tastatur vorhören und lädt sich anschliessend den passenden Sound in den Sampler. […] Zum Redaktionstipp fehlt mir persönlich nur noch die Kompatibilität zu REX und Co. An der Qualität der CD ist ansonsten nichts auszusetzen! Fazit: Auch der ersten Sampling-CD von Sounds-of-Revolution merkt man die Liebe zum Detail an. Nicht nur die Loops, sondern auch der überwiegende Teil der spielbaren Sounds wurde neu programmiert. Alle tonalen Samples enthalten im Namen die Tonart! So sollte es sein. Preis-/Leistung gehen nicht nur aufgrund der Vielfalt voll in Ordnung. Neben 1a Loops erhält man einen gut sortierten Fundus an Drum- und sonstigen clubtauglichen Einzelsounds in hoher Qualität. Wem so etwas noch in seiner Sammlung fehlt, der kann hier bedenkenlos zugreifen. […] Although this CD covers a wide spectrum of electronic dance genre, the highlight of this library is the 575 kick-free loops. These serves as “top” loops that can be used to augment your main drum loops. Other worthy of mention are the juicy contents of the “Electro stuff” folder. These are full of inspirational loops to start a song. If you may say, the idea of Club Revolution Vol.1 is to interest producers in having everything in one sample library, to have a good selection of sounds in differenz formats, and a variety of electronic genres that it can serve. Club Revolution meets the above purpose and more.